Last Friday I took a wrong turn on the way to a restaurant and stumbled upon The Nightingale. Rather than turn around and look for the orignal restaurant I decided to give The Nightingale a try. I’m really not sure why as I knew absolutely nothing about it and from the outside it looked like an average pub. It was just a strange sort of hunch, one i’m very glad I listened to. I wasn’t convinced that i’d made the right decision when we first sat down as the inside was also very underwhelming and I worried that I’d brought us to a rough local pub. However, I felt much better upon reading the menu, as along with the usual pub classics were interesting sounding dishes such as ‘Smooth Duck Liver & Orange Pâté with Homemade Chutney & Toast’ & ‘Wedge of Deep Fried Brie Served with Redcurrant Sauce’. I ordered a starter of ‘Cajun Chicken Salad with Pineapple Salsa, Rocket & Cherry Tomatoes’, it arrived looking very elegant and tasted good too. The chicken was well cooked and nicely spiced, the sweetness and freshness of the pineapple salsa complimented the Cajun perfectly. 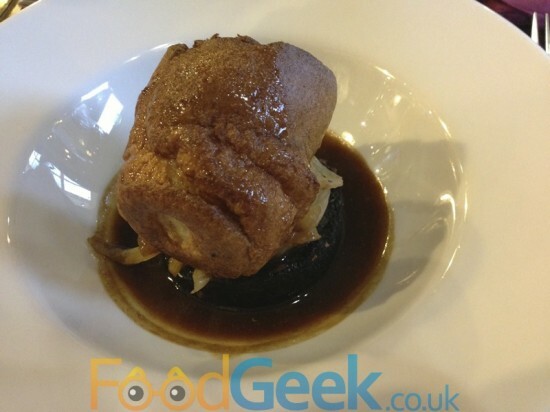 Mrs FoodGeek chose from the specials board, ‘Yorkshire & Black Pudding with Onion Gravy’. It was a bit special too! A really good Yorkshire pudding (well, we were in Yorkshire) sitting on a huge slice of soft and earthy black pudding and a rich onion gravy. A hearty and very tasty dish, not sure it quite fits into a January detox plan though. 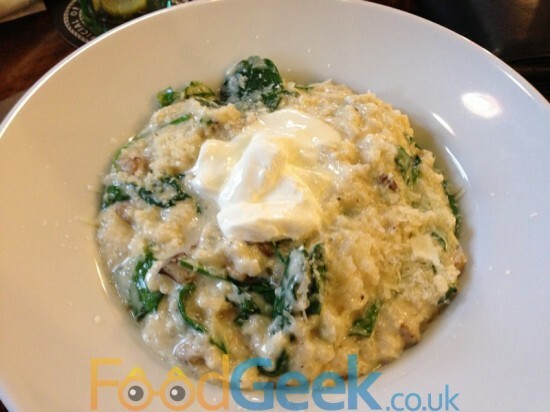 My main course of ‘Spinach & Mushroom Risotto with Herb Oil & Sour Cream’ was also excellent. Perfectly cooked rice, good seasoning, full of flavour from the mushrooms and very rich & creamy from the luxurious sour cream and parmesan but very cleverly lightened by the spinach. Perhaps feeling guilty for finishing her Yorkshire and black pudding starter Mrs FG ordered a salad main course. 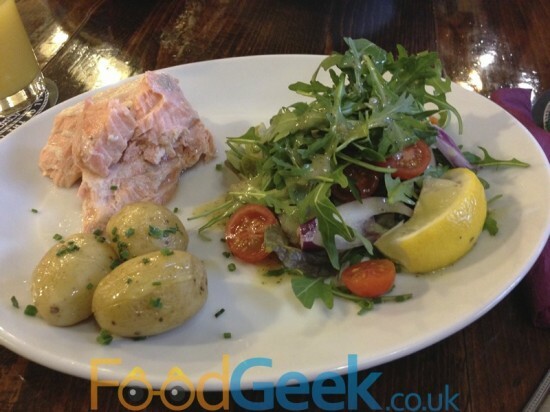 ‘Poached Salmon Salad with Buttered Potatoes’. The salmon was very well cooked but cold which we found a little odd with the hot buttery potatoes. Overall though it was a very simple but light and tasty dish. There were lots of great sounding traditional desserts on the menu, we went for ‘Sticky Toffee Pudding’ and ‘Jam Roly Poly’ the first time i’ve seen the latter on a menu for years. Both were fantastic, so good in fact that we got stuck into them the second they arrived and forgot to take photos, sorry! The Sticky Toffee Pudding was very sticky, packed with vanilla flavour, swimming in rich toffee sauce and topped with delicious vanilla ice cream. A very naughty but hugely enjoyable dessert. The Jam Roly Poly was equally good, the suet was soft and actually quite light. There was plenty of jam and custard, it’s not fancy but it tasted great. Service was very friendly and generally efficient although the staff did disappear on a couple of occasions when we needed them. 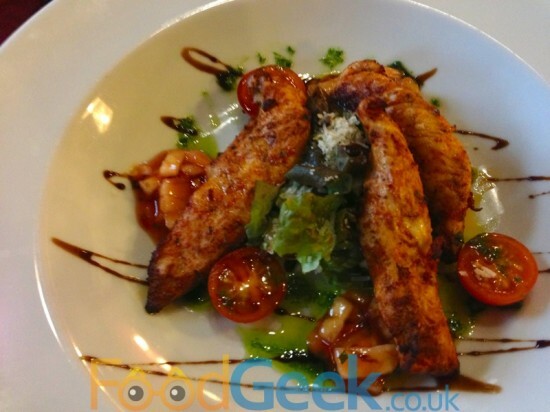 Overall though it was a hugely positive experience at The Nightingale, a high standard of food, generally good service and very good value. I’m glad that I took that wrong turn, i’d be very happy to return if i’m ever in the area again.